Later during Skaggs’ lecture the inevitable question came up, “What have you done recently?”. Skaggs walked over to a television monitor and popped in a tape of Professor Lyons playing him on NBC earlier that day. Needless-to-say, the audience screamed with delight. Immediately after the lecture presentation, NBC was besieged with calls. 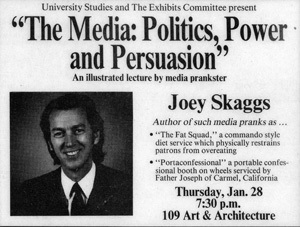 The next day they came and interviewed the real Joey Skaggs for their retraction. This was a simple, opportunistic hoax. But it was a good example of some of the issues Skaggs’ had addressed during his presentation, that is, how easy it is to be fooled when you accept things at face value.